Quinnipiac offers outstanding opportunities for undergraduate and graduate business education, including 11 undergraduate majors and 3 graduate (online and on-campus) programs. Faculty with research credentials and business experience create exciting and relevant classes; extensive career support services led to our most recent 96% placement rate and strong school support for student academic competitions and research add to the development of leadership and analytical skills. The Goodwin Financial Technology Center hosts sophisticated financial data resources. All programs are accredited by AACSB International. In addition to the application, the admissions committee requires the following from its applicants: official transcripts for all post-secondary academic work; an official GMAT score report; a personal essay; undergraduate GPA; two letters of recommendation; and a current resume. The GMAT score and the undergraduate GPA are most important in the pr...In addition to the application, the admissions committee requires the following from its applicants: official transcripts for all post-secondary academic work; an official GMAT score report; a personal essay; undergraduate GPA; two letters of recommendation; and a current resume. The GMAT score and the undergraduate GPA are most important in the process. Also considered are work experience, extracurricular activities, and an interview. TOEFL scores are required for those whose native language is not English. The average GPA for admitted students is 3.25, and the average GMAT score is 565. There is a high acceptance rate at Quinnipiac, and the admissions process is rolling. The five-year MBA program is open to Quinnipiac undergraduates only. Career services at the School of Business, include individual career counseling appoint­ments, career fairs, on-campus recruiting, and mock interviews. If students need help writ­ing resumes and cover letters, that is also provided. Additionally, there is an online tool called QU Career Connections where students can view job listings, add their resume, and sign up for interviews. The School of Business “has an extremely devoted team that works diligently to host network receptions, maintain the career website, assist with resumes, and regularly communicate with students.” Also, there is “a new director of the business school who has worked very hard to make QU more competitive and to bring new employers to recruit.” QU “has been great at providing work opportunities for all the students in many diverse fields in the business world.” Part-time students are concurrently employed by some of the following organizations: Bayer, Yale New Haven Hospital, and United Technologies. At Quinnipiac University, located in Hamden, Connecticut, a conventional MBA is offered along with options to specialize in Healthcare Management and Supply Chain Management. Students may also choose to pursue a CFA (Chartered Financial Analyst) cer­tification. Quinnipiac also offers Internet classes to help students achieve these goals, as well as full online MBA program. The school of business is comprised of part-time profes­sionals, as well as full-time students pursuing a joint BA/MBA or a joint BS/MBA. Part-time students can choose from evening classes or accelerated online courses, while the full-time program offers classes in the afternoons and evenings. Students choose Quinnipiac because it’s “strong in finance and accounting.” It has an “excellent reputation,” “hybrid MBA” program, and a “good teacher-student ratio.” Students enjoy the small class sizes, claiming “the professors know all their students.” Small class sizes translate into a “more personalized” educational experience. “Professors are very visible and very willing to help. They really invest their time in the students and understand the real-life issues (work, family obligations, etc.) that we face.” Professors also bring “real-world experience” into the classroom, and “the courses keep up with current trends.” Professors are “smart,” “challenging,” and “available.” Students are often given group assignments, which culminate in a presentation. “This prepares you for presenta­tions in the real world, as well as building your skills to work with others.” Students emphasize the “practical” education they receive. Professors also take the time to “speak with students about their particular fields.” Most agree they’ve had a “great experience” with Quinnipiac faculty. 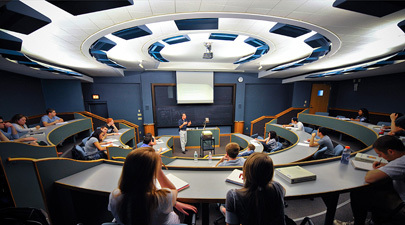 The “classroom facilities are some of the best I’ve seen.” The program has “high-tech equipment for presentations, a Financial Technology Center for real-time trading, and HD video monitors that constantly keep us up-to-date on current news.” One student admits the facilities are what made Quinnipiac a top choice. “The administration has a solid strat­egy of how to make Quinnipiac a major university with many opportunities. Unfortunately, the MBA Director position has seen high turnover in recent years.” Quinnipiac students admit its reputation is slowly growing. Still, they praise the adminis­tration’s flexibility. Joseph Onorato '71 - CFO (retired) Echlin, Inc.
Want more info about Quinnipiac University, School of Business Full Time MBA? Get free advice from education experts and Noodle community members.